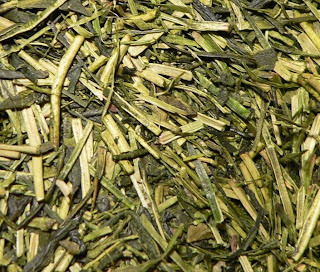 Kukicha, stalk or stick tea is made of four sorts of stems, stalks and twigs of Camellia sinensis. Kukicha has light flavour, fresh green aroma. It has very light yellow-green colour. It can be added to a juice to make a drink for kids. Kukicha is a strong antioxidant and its level of caffeine is the lowest among all traditional teas. For best results, Kukicha is steeped in water between 70°C to 80°C (155°F - 180°F) for three minutes (otherwise, like all green teas, the result will be a bitter, unsavoury brew). Some suggest that Kukicha can be dry fried in an iron pan to make it more alkaline and good for diseases that thrive in acidic conditions. It is an inexpensive tea of enthusiasts, rarely drank outside Japan. I absolutely love kukicha (twig tea.) It is the only green tea I drink. I love its sweet, mellow taste. I know that kukicha is considered a low grade tea, but to me it is perfect morning, noon, and night. Although I am a coffee lover, but I love tea too, especially green. Your blog, Mislav, is a beautiful work.